On the 22nd of May, Caz will be running a creating on canvas workshop here at the shop! This is what we will be making! 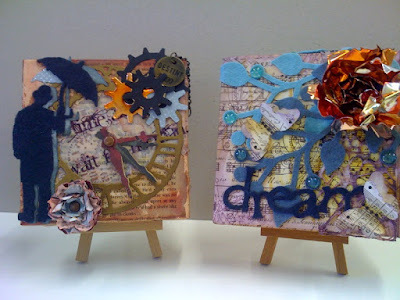 Using lots of Tim Holtz' goodies, these canvas pictures are ideal as a gift, or just to make for yourself! The class will run from 11am till 2pm. Bookings can be made - have a look here for details.